Prebena H staples by Fasco, made in Europe. 5/16-inch crown, 18 ga. Interchangeable with Bostitch SL5035, BeA 92, Atro 92, Spotnails 92 series staples. BEA 92/ SL5035 staples 3/8-inch Divergent. Galv. 10,000/box. Made in Europe. BEA 92/ SL5035 type staples 3/8-inch, Galv. 5,000/box. Spotnails Brand. BEA 92/ SL5035 type staples 1/2-inch, Galv. 5,000/box. Spotnails Brand. BEA 92/ SL5035 type staples 5/8-inch, Galv. 5,000/box. Spotnails Brand. 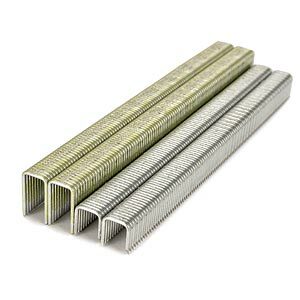 BEA 92/ SL5035 type staples 3/4-inch, Galv. 5,000/box. Spotnails Brand. BEA 92/ SL5035 type staples 7/8-inch, Galv. 5,000/box. Spotnails Brand. BEA 92/ SL5035 type staples 1-inch, Galv. 5,000/box. Spotnails Brand. BEA 92/ SL5035 type staples 1-1/4-inch, Galv. 5,000/box. Spotnails Brand. BEA 92/ SL5035 type staples 1-1/2-inch, Galv. 5,000/box. Spotnails Brand.